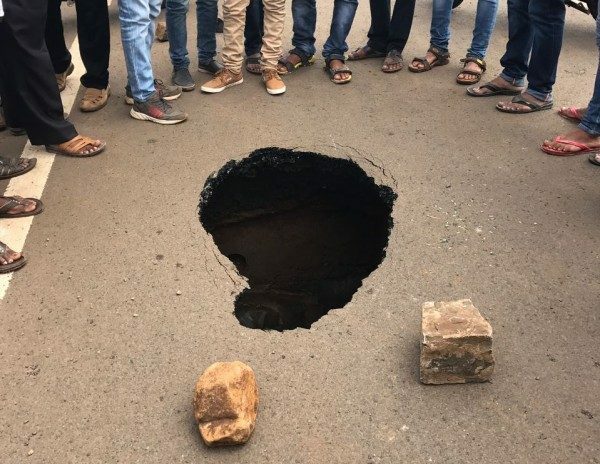 The piece of road on the Bauxite road suddenly caved in near the Maratha Mandal institutions at around 1140 AM on Wednesday. Thankfully no casualty occurred as the passers by saw it and stopped the vehicles. What is seen inside seems to be a drain ? I think ……………. its a pvt tunnel to CHINA………………….. with rgd’s to BCC.. nd all d useless Politician’s of BELGAUM !!! Road Contractor and concerned department person need to be punished.